Wednesday saw the mercury rising across central California. Bakersfield hit 94 for a high- the hottest day of the year so far. Our record for this date is 100 set in 1910, but tomorrow's record is only 97. We will be getting close to that value on Thursday. 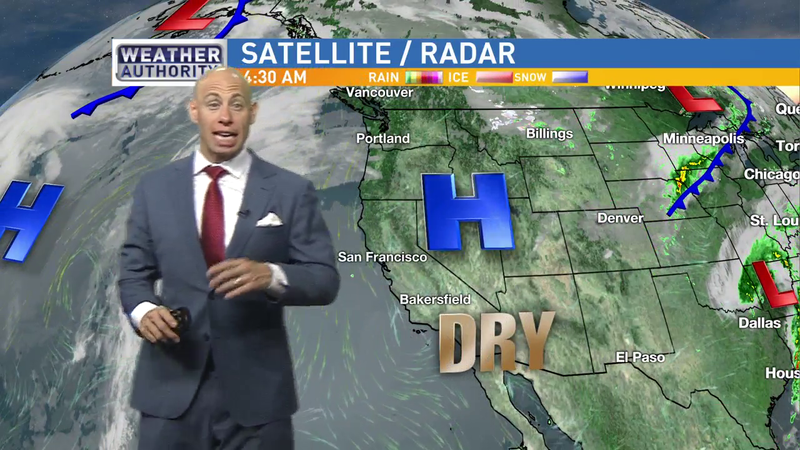 Upper level high pressure remains strong and sunny skies will again prevail, with highs at least as hot as today. My forecast is for mid 90s again. But the ridge will start to slowly slide off to the east with a moderation expected through Saturday. Each day will be slightly cooler than the day before. By Sunday, highs will drop into the upper 80s. While the polar jet stream is well north of California, a spinning circulation has broken off of that river of air out in the central North Pacific. The cut-off low is expected to slowly and stealthily move in our direction. By next Monday computer models are showing the low beginning to affect our area with cooler air. Scattered showers and thunderstorms are possible on Monday as the low passes by just to our south. Daytime readings will be noticeably cooler to near normal levels for the last days of April. Highs should return to the upper 70s or near 80 as we flip the calendar over to May. Rainfall with the transition is most likely in mountain areas where up to a quarter inch of rain could fall. Perhaps more important is that the spinning and drifting little low pressure center will be the opening act of a cooler pattern. Both major global models bring a general area of low pressure back to the western US by next week. That means our unseasonably hot weather at this time will be coming to an end. Normal temperatures return next week and appear to stay for the remainder of the 10-day forecast period. I am not forecasting much rain, but I am predicting much cooler weather. Our Hot Times Contest has not yet begun, but hopefully we will get that annual contest going fairly soon.